BOLOGNA, Italy, April 4, 2019 /PRNewswire/ -- The 56th Bologna Children's Book Fair (hereinafter referred to as "the BCBF") was held from April 1st to 4th. Publishers from over 70 countries and regions flocked to the event in Italy, since it is the world's largest and most influential exhibition staging children's content. 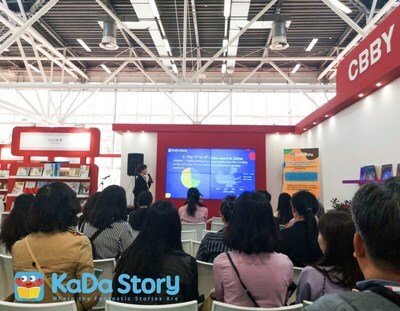 KaDa Story, a leading children's digital reading platform in China, jointly attended the BCBF with the Chinese delegation, which was supported and guided by the Import and Export Administration of the Publicity Department of the Communist Party of China Central Committee. 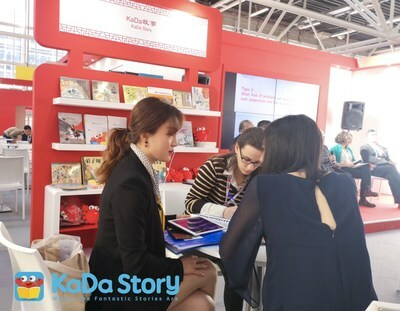 At the exhibition, KaDa Story rolled out its competitive Chinese original works Chinese Folk Tales Picture Book series for the first time. This picture book series, which contains stories with Chinese characteristics, such as The Legend of Lady White and Chang'e Flying to the Moon, was selected according to one billion bits of KaDa Story's reading data representing children in 162 countries and regions. It has overcome obstacles in cross-cultural communication and has presented a lively feast of traditional Chinese culture to children all over the world. Jointly completed by renowned children's literature writers and illustrators who have won awards like the Feng Zikai Chinese Children's Picture Book Award, the Hsin Yi Picture Book Award, the Bingxin Children's Literature Award, and the Hong Kong Youth Literary Awards, this picture book series has gained the favor of well-known international publishing agencies such as Penguin Random House. Launched in 2015, KaDa Story focuses on providing early reading services for children 9 and under through audio-visual picture books and audio stories. During the exhibition, the company unveiled children's content with Chinese characteristics to the world and established a channel for global publishers to make a quick and direct entry to the Chinese market. The public is paying increasing attention to children's reading, which has led to a great boost of China's digital reading industry. According to China's sixth national population census, the number of children 14 and under has reached 221 million, and the value of children's consumption was expected to top 4.5 trillion yuan. In response to this trend, a growing number of publishers are trying to deliver high-quality stories to Chinese kids. Unfortunately, they missed a few golden opportunities due to promotional troubles and failures to target the right users. KaDa Story plays a significant role in bridging different cultures. With its multiple content distribution channels, KaDa Story has been introducing a mass of brilliant stories to hundreds of thousands of families in an efficient way. More than its own 20 million users, it has become a partner of almost all major intelligent hardware providers and channels in China, including Tmall Genie (a smart speaker of Alibaba), DuSmart Speaker (a smart speaker of Baidu), DingDong JD+ (a smart speaker of JD+), DragonFly FM (China's leading online audio app) and ROKID ALIEN (a technology start-up specializing in robotics and AI). On the basis of this, KaDa Story's content covers potential users in a variety of scenarios. Meanwhile, the company offers digital content solutions for preschool children in thousands of kindergartens, and it also offers customized content for public libraries and other public cultural institutions. Through such efforts, numerous users are able to enjoy instant, unlimited access to high-quality audio-visual picture books and audio stories. Moreover, a set of intelligent algorithms based on big data that analyzes the stories, users' basic information and reading habits allows KaDa Story to accurately recommend content to each child. The platform has introduced over 30,000 audio-visual picture books and audio stories, and it has been used over 1 billion times. KaDa Story attaches a parallel importance to respecting children's diversified personalities and improving the efficiency of content transformation. As a result, it maximizes the value of its content. As the copyright economy develops, users are more willing to pay for high-quality content. Unclear accounting systems, however, may make it hard for creators to be paid reasonably, which negatively influences the sustainable development of the system. That's where KaDa Story stands out from others: it enjoys a transparent and safe profit allocation mechanism. The subscription and sales system will real time monitor each book's reading and subscription, which can be shared with the relevant partners. For instance, content partners are not only able to track the details of their income, but they can also optimize their content based on data like reading rates, completion rates and review rates. KaDa Story, at the same time, regularly prepares reports on user behaviors for them, assisting content providers in more thoroughly understanding the properties and preferences of Chinese users. As a result, they see better promotional effects and profits. Over 200 content institutions worldwide, including The Walt Disney Company, have trusted KaDa Story and become one of its partners. They together brought numerous foreign picture books to China, which have won Chinese children's hearts since their release. For example, Noah's Ark, a picture book by Peter Spier and a winner of the 1978 Caldecott Medal, attracted 40,000 subscriptions within eight weeks after its launch on KaDa Story. Animals: A Children's Encyclopedia from DK U.K. achieved nearly 1.5 million clicks within six months after being released on the platform. Bearing the mission of "delivering the best stories to children", KaDa Story consistently handpicks inspiring stories worldwide and works on bringing them to children as soon as possible. It firmly believes that fantastic stories undoubtedly,light up childhood and children will get lifelong benefit from them. Do not let our children miss out on these good stories during this limited time of their childhood.